1. General Observations: All along the New England coast, cruising destination harbors are very crowded with local commercial and pleasure craft. 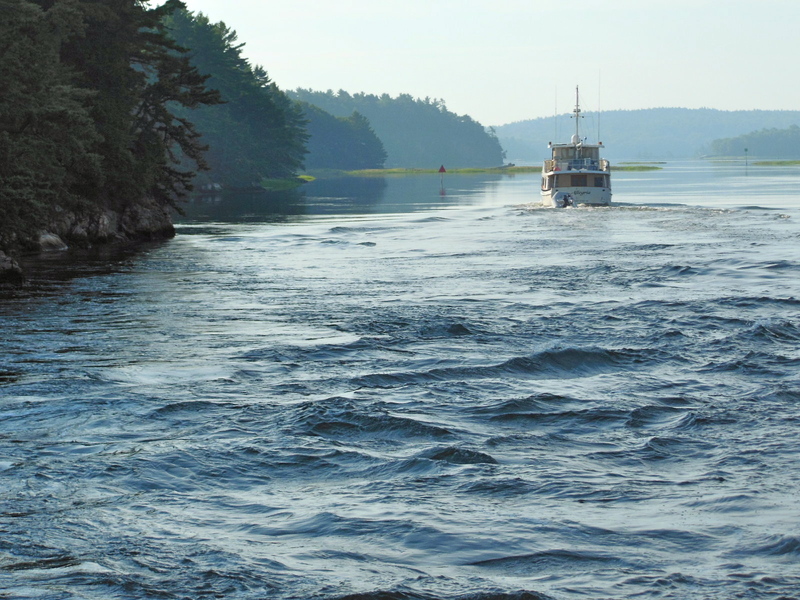 Between New York City and Cape Cod, tides range around 4 ft. From Cape Cod to Acadia National Park at Penobscot Bay, tides range from 9 ~ 12 ft. Cruising destination harbors are often exposed to seas and winds in one or more quadrants. Anchorage locations in New England harbors are often significantly deeper than those of the mid-Atlantic, southeast and gulf coasts. Tidal currents are significant, and much more of a persistent factor in navigation than anywhere on the mid-Atlantic or southern bays, sounds, rivers and ICWs. Even offshore in and northeast of Massachusetts Bay, the set of tidal currents is appreciable, and must be anticipated and compensated in avoiding lobster floats and other in-water obstructions. In many areas, it is advantageous – or necessary – to time travel around tidal currents. Strong tidal flow is the rule in all regional rivers. In the Annisquam River, the York River, the Kennebec River, Upper and Lower Hell Gate on the Sasanoa River, and many other places, tidal currents can run to several knots. Many of these places have very narrow cuts and passages. The Annisquam is narrow, shallow and often crowded with local, small boats, and has two drawbridges. These factors affect cruising boats, so travel at or near slack in these areas is advantageous. 2. General Cruising Practice: Most commonly in this region, cruising boats overnight on mooring balls, or in some areas, floating docks moored away from shore. Launch service is available in some mooring fields, but not all. Mooring field facilities are variously managed by towns (through “harbormasters”), yacht clubs, launch services and other private companies. The daily rental cost for mooring facilities that include launch service somewhat exceeds those that do not, but convenience and the avoided cost of operating a dinghy is offsetting. In 2012, mooring balls ranged from $25 – $30 per night without launch services, and $35 – $45 per night when launch services were included. In more remote areas, local custom seemed to be to pick up a vacant mooring ball for the night (“weekender balls”). One would be expected to move, of course, if the owner were to come back and want their ball. 3. Marinas and Fuel: During the Summer, 2012, marina dockage cost at least $3.50 per foot per night. Brewer’s Marinas are very nice, available in many cruising destination locations, and are very expensive; they start at $4.50 per foot per night. Brewer’s offers a “Cruising Club” discount. The first Brewer’s marina that you stop at can give you the Cruising Club card, which is free. Mystic Seaport reciprocates with Brewer’s in their cruising club. Mystic Seaport also had their own promotion that amounted to “buy 4 nights, get a 5th night free.” The Brewer’s Cruising Club card gets you 25% off at all Brewers facilities for dockage and mooring balls. Marina docks throughout the region are floating. Marina charges usually *include* shore power. Yacht Clubs generally welcome visiting cruisers. Although many belong to YCOA and advertise yacht club reciprocity, virtually none actually extend any reduced rate reciprocity deals. All they do is rent mooring balls/slips at their regular transient rates. We found occasionally that transients were *not* welcome to use club house facilities. Fuel is available at competitive pricing in some New England locations. There is no sales tax on fuel in Connecticut or New Hampshire. That technicality, however, is not always reflected as an advantage in pump prices, so due diligence in fuel purchasing is required. Overall, we found that cruising costs in the region were significantly more than we had anticipated beforehand. 4. Anchoring: As “first-timers” to the region, we had expected to be able to anchor frequently, as has been our past experience in the mid-Atlantic and Chesapeake Bay, and our personal preference. In general, anchoring in popular transient destination harbors is impractical. In 2012, regardless of what the cruising guides reported, it was our experience that charted anchoring locations in popular locations were completely taken up by mooring fields. Anchoring is actually prohibited by law in some of these harbors. Where anchoring is permitted, it is always at the most distant edges of the mooring fields, which means long dinghy excursion distances, deeper water, more wakes, and less protection from weather and offshore swells. In Boothbay Harbor, the charted anchorage area was almost a mile from the town center/town dock. With a MLLW anchorage depth of 30 ft, a 10 ~ 12 ft tide, and our 5 ft pulpit elevation above the water, a scope of 4:1 required 188 ft of rode, and appropriate swing room, in settled weather; more scope if conditions are unsettled. 5. Cruising Boat Equipment: Because overnights are spent mainly on mooring balls or anchored out, it is essential to have a reliable means to re-charge vessel batteries. A genset is an important piece of onboard equipment, and must be maintained in top operating condition. Batteries must be in known good condition, and a good battery monitor is recommended. Ground tackle must accommodate MHW depths of 40′ ~ 50′. One or more alternative means of catching and picking up a mooring ball pennant is recommended. It is essential to have a way to track NOAA weather and sea state forecasts. Internet access for tracking weather is generally not reliable in the northern and far eastern portion of New England. Sanctuary subscribes to the Master Mariner Satellite Service from Sirius/XM. We use an XM radio and software package called “WxWorx On-The-Water” to receive and display the Master Mariner satellite data feeds on a Windows-based computer. This eliminated the need for Internet connectivity. Alternatively, some high-end chart plotters also have the capability to display the Master Mariner data feeds, too. AIS is becoming more widely deployed, and can be very helpful in poor visibility. At a minimum, a dual-channel AIS receiver is recommended. Marine chandleries are not available in many places, so the selection of spare parts, spare consumables, hand tools and test equipment is important to self-sufficient cruising. We heard many hails for both BoatUS and SeaTow, so we conclude having towing insurance might be advisable. 6. Holding Tanks: Many popular locations are served mainly by pumpout boats. Many marinas use pumpout boats in place of land-based pumpout equipment. In Boothbay Harbor, the local pumpout boat stopped operating at noon on Saturdays. This seemed a strange practice during the peak of the cruising season, in an area that claims to cater to cruisers, and is supposedly socially conscious about pumping out rather than overboard. Only one local marina had land-based pumpout infrastructure, and it was down that Saturday due to a power outage on their dock. Ultimately, a marina produced a portable, hand-operated pumpout cart to serve us. Getting pumped out that Saturday involved extra time, anxiety, inconvenience and significant extra cost. 7. Dinghies: A dinghy in good operating condition is essential to a successful cruise in this region. Without one, cruiser’s options are severely limited, or extremely expensive, or both. Generally in the region, the dinghy is used so frequently that cruisers tow their dinghies from place to place. Appropriate towing gear is absolutely essential. Outboard motors must be in top operating condition. Dinghy excursions are generally easy in the early hours of the day, but as afternoon hours progress, sea breezes can make for bouncy, wet dinghy rides. 8. “Protected” Harbor: Ocean seas often refract around jetties and natural harbor entrance features. During the ebb and flood of daily tide cycles, boat orientation will follow the tidal flow. Twice during each cycle, boats will lay sideways to even small harbor surface seas. Even in otherwise settled evening and overnight conditions, this often means much more rock ‘n roll than one might expect or appreciate. Nighttime motion – sometimes significant motion – is not uncommon. Wakes are a daytime fact almost everywhere, and occur around-the-clock in major harbors. 9. Sea State Forecasts: NOAA sea state forecasts reflect ocean shelf cruising conditions, which are very different from the inland conditions found on east coast bays, sounds and river estuaries. A sea state on Penobscot Bay of 2′ ~ 3′ is generally comfortable and easy. These seas are composed of long period swells with no wave crests. One feel’s a gentle up-and-down motion as wave energy passes beneath the boat. That same sea state prediction of 2′ ~ 3′ on the Delaware Bay, Chesapeake Bay, Pamlico Sound or Albemarle Sound would mean short period, breaking, wind-driven waves; “lumpy” conditions, uncomfortable to many people. It is, however, very necessary to be aware of both wave height and wave direction. Even 2′ ~ 3′ ocean swells can be uncomfortable for small and mid-sized cruising sized boats if they fall abeam. 10. Navigation Charts: It is always best to have up-to-date navigation charts, especially when cruising in new and unfamiliar waters. However, many cruisers with a lot of experience cruising the New England region pointed out to us that the coastal geographic features of the region are mainly rock, and have been in the same place for many thousands of years. Charts are accurate and complete. In general, this region is not subject to the vicissitudes of natural shoaling so common further south. 11. Marina Slips: All marinas are fit with floating docks. Gangways that lead from the float level to the shore elevation can be quite steep. Marinas are three to four times more expensive in this region than in the Chesapeake Bay, the mid-Atlantic, and the southeast; and more-so still when compared to the Great Lakes, Inland Rivers or Gulf Coast. Marina operators say they have a short season here, but it’s no shorter than on the Great Lakes. Except in certain popular and high traffic harbors, the inventory of transient slips is minimal. Marina slips can be hard to find on weekends, especially holiday weekends, during local community celebration events, and during periods of threatening and/or unsettled weather. 12. Lobster float density: “Disclaimer:” we were advised that because of cyclical lobster fleet economics, 2012 was an unusually idle year for many lobster fishermen. There was a glut of lobsters on the market, and commodity (though not restaurant) prices were at historic lows. An article in the Portland, ME, newspaper described picketing by Canadian lobster-men in a New Brunswick lobster processing plant to exclude importation of cheap, Maine lobsters by US lobster fishermen. In Maine, it appeared many lobster-men were not fishing because they were not able to break even in the current market. With the above “disclaimer” offered for its potential context, our experience was that the in-water density of lobster floats was no greater than the in-water density of crab pot floats on the Delaware or Chesapeake Bays, or the Albemarle Sound. However, the scale of lobstering in Maine is far greater than the scale of crabbing on mid-Atlantic bays, sounds and estuaries. Fields of lobster floats are essentially continuous north and east from Portsmouth, NH. And while crabs seem to live in shallow water, lobsters apparently prefer deep water. We found lobster floats to be relatively common in 100′ ~ 150′ of water. This means it could be imprudent to run at night, even though you are running the open North Atlantic Ocean. (Yes, some new Radar units are capable of detecting lobster floats. However, partially or completely submerged floats were not unusual, so we suggest that running at night – even offshore – is to be carefully considered.) Lobster floats in deeper water often have an auxiliary float attached to them via a short pennant. Boats should not pass between the auxiliary float and it’s host float, as there is a real risk of snagging the pennant line between them. Boats with stabilizer fins are more at risk of snagging floats on their stabilizer fins than on their running gear. 13. Daily “Travel Routine:” As a generalization, we found it best to start our day early and get settled in early in the afternoon. The daily atmospheric cycle is that as the sun comes up and warms land masses, on-shore sea breezes pick up. Afternoon breezes can be significant, even in otherwise fair, clear weather. Warming at the surface will also often give rise to cumulus clouds along the shore. Sometimes, this cumulus development continues into afternoon showers. 14. Pre-planned Routes: As “first timers,” we *always* established pre-defined routes for our chart plotter. Because the ubiquity of lobster floats requires frequent avoidance maneuvers, it’s generally not practical to run a route via autopilot. However, having a reliable, customized course line on the chartplotter can be very helpful in narrow cuts, in unfamiliar areas, or when poor visibility develops quickly and unexpectedly. 15. email and Cell Phones: VerizonWireless cell service was mostly available, with some gaps, as far as Acadia National Park. Broadband Network data services had numerous gaps after moving east of Casco Bay. A cell phone amplifier system seems to make a difference for some cruisers. In marginal areas, we found we often had data network connectivity in the pre-dawn and early daylight hours but lost it when the sun came up. We also found we were roaming a lot after arriving on Penobscot Bay. 16. Fog: Fog can be troublesome. Visibility can and does go from completely clear to heavily shrouded in a matter of feet; literally.When we got caught in fog (we never started out in fog) we reduced speed to “slow bell.” Effective use of Radar at short range scales is essential. In poor visibility, one of our chart plotters was used exclusively for Radar tuned to a short distance scale, and the other chart plotter was used to display our pre-defined route. Without external visual references, it is extremely hard to manually steer a straight course, and the effort of doing so is greatly distracting to effective watch-keeping. When fog closes in, the combination of a pre-defined route, the autopilot and Radar was a huge safety assist. 17. Foghorn: Be sure to know how to activate your fog signal hailer; when you need it the first time is not the time you want to have to figure out how to make it go. Also, know it’s operational behavior; our ICOM M504 VHF radio’s fog hailer resets itself anytime the transmitter is keyed. You have to know that, and manually re-start the fog hailer. 18. Local Place Names: In poor visibility, one hears many “security” calls on the VHF radio announcing the location and direction-of-travel of other boats. That’s all well and good if you are familiar with the area, know and recognize local place names, and know the location of local land marks in relation to where you are. As first-timers and newcomers to the region, we mostly did not. There is enough stress in these situations without chasing around charts for local place names, so don’t worry about this one. Simply use your audible fog signals and proceed at “slow bell.” Between Vinalhaven Island and Rockland Harbor on West Penobscot Bay one early afternoon, we encountered a cloud of densely shrouding fog midway across. And within that dense fog, we then encountered an imbedded passenger ferry. From her foghorn, we could tell she was big. We could see her on Radar (but no AIS), and I’m sure she could see us. By the time we had actual visual contact, I could read her name on her life rings without benefit of binoculars. But, we were proceeding slowly, and we avoided each other because we used the audible fog signals and signal horns. 19. Sailboats: The USCG COLREGS Rules state that sailboats are just ordinary, old power boats when running their engines, even if their sails are also deployed. Virtually no sailboaters acknowledge that “trivial, legal technicality.” Even on great, open expanses of water, expect that sailboats will cut in front of you, definitely if under sail, and usually if under power. If that is your expectation, you will never be surprised or disappointed. They will force you divert your course, and they will get mad and make gestures at you simply for being there. They will do this, of course, in clear conditions in large fields of lobster pots. We encountered many sailboats with AIS transponders. AIS transponders are not widely deployed in a high percentage of “the fleet,” but they seemed to be in use on a significantly larger percentage of sailboats than power boats. We found it puzzling, then, that those sailboats seemed to have plenty of battery power for their AIS transponders, but they consistently failed to answer up on the radio when hailed on either VHF16 or VHF13. Finally, we observed that many sailboats utilize small, hand-held air horns as their foghorn sound signaling devices. As an approach to good seamanship and safety afloat, these practices seem selfishly unwise and ill-advised, but nevertheless was our experience. 20. Lobstermen: Working lobster boats abound. For them, there is no such thing as “no wake” speed in harbors. After all, they belong there, and you do not. While not necessarily true in harbor, on the open water, most lobster boats will not intentionally infringe your approaching or crossing path. You may occasionally have to divert for one. Don’t call them on the radio; they don’t have time for you, and you won’t understand them if they do respond. In general, trawlers and slow cruisers will not have to divert around them; if they appear to be in your path as you approach, they will usually have moved off by the time you get to where they might have become a collision hazard. This entry was posted in Maine and New England Coast on 2013/01/07 by gilwellbear.